What can I do and what paperwork do I need to process the divorce of a person who is out of the country? I live in Florida, and have a child with him. We do not have a property together. Please help! As long as either you or your spouse is a Florida resident, you can file for divorce in Florida even if one of you is not in the state or out of the country. In many cases, if your spouse is a military member on an overseas assignment, and he was a Florida resident prior to the assignment, then he is considered a Florida resident for the purposes of a divorce. Many courts will allow your spouse to appear at a final hearing for divorce via telephone. All he needs to do is file a motion to appear telephonically. 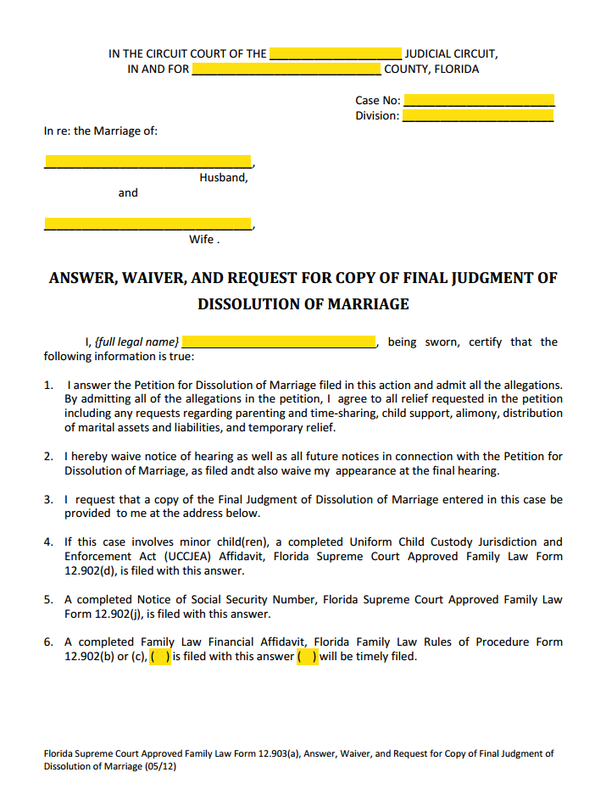 If this is an uncontested divorce, the divorce paperwork involves all the normal divorce forms, but may include an Answer & Waiver Form 12.903(a). You'll notice that this is one of the forms the Florida courts has not updated to make fillable. You can download the fillable version on our Family Law Forms page for free. You may need to provide the court with all copies of financial records and other information where calculations are necessary for issues such as alimony and child support. If you cannot reach your spouse so that he can be served the divorce papers, you can still divorce using the missing spouse divorce procedure. You can begin this process by filing a petition for dissolution of marriage. The missing spouse divorce simply adds the step of running an advertisement and using the diligent search procedure.